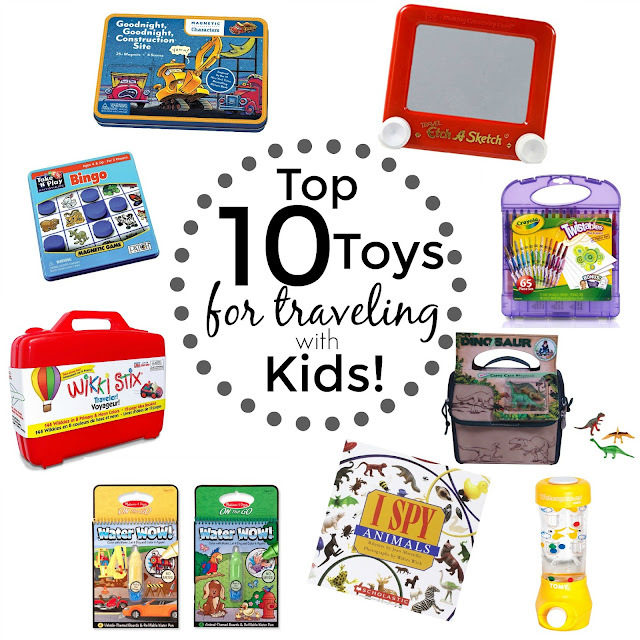 We are about to embark on our fifth road tip this summer and while packing up the boys' things I thought it would fun to share some of our favorite toys to travel with. While both of our traditional destinations, my parents house and our family beach house, have an abundance of toys for our boys to enjoy immediately upon arrival, it's places like hotels and extra long car rides that can be a bit tricky to manage when we're traveling toy-less. You can't put a price on car ride quiet and while I don't think any of these toys are overly expensive, I can guarantee you they are worth their weight in silence. 1. Magnetic Play Sets Earlier this year we received a couple sets of these from my mom and let me say, they never leave the car! The boys absolutely love them. After all, my mom gives the BEST gifts and she always finds the latest and greatest kid stuff! What I love most about these sets is that the pieces are easily stored within the metal tin (I'm a major fan of any small toys with lots of pieces that can be concealed in the box they come in!) and with so many fun options, they can entertain kids of all ages, especially my three boys at 6, 4 and 2 years old! Goodnight, Goodnight Construction Site is a current favorite. Similarly, Take N' Play Bingo, also magnetic, is another great family game for long car rides. I recently stumbled across these fancy things at our local library and they are so cool! They're essentially colorful sticks that you can bend, twist and mold into practically anything and they stick to most smooth surfaces. The boys like to create animals, vehicles and other neat shapes and once again, I love that they come in a travel box for mess-free storage. And yes, they are reusable! Compact, reusable and fun for varying ages, these books (and mat) provide hours of endless fun while on road trips. It's basically painting without the mess which means kids super love it. The activity books are very durable and will last a long time (unless one of your kids throws them into a kiddie pool. Then you're out of luck). Here's another excellent find by my mom. Not only is this a great toy for the car but it's also perfect for hotels, campers, etc. Why? Because it's an entire play set in one. The tote unzips to become the perfect play mat for the creatures previously tucked inside and while my boys went wild for the dinosaur set, it wasn't long before they were begging for the Hot Wheels Tote and Play Mat. We even upgraded our tote and play mat set to the larger crate size! These books are geared towards younger children (ages 2-4) and keep them engaged and entertained for quite some time! These are a big hit with my 4 year old. I often have the boys draw pictures of what they see from their windows while we're on the road. It's similar to a "travel journal" of sorts but much more age appropriate for them and I love seeing things from their point of view. Not only does this art box come with blank paper but the crayons also snap into the case to avoid them rolling away! These are literally gallon Ziploc bags filled with a bunch of crap from the Dollar Store. It sounds crazy but my kids love this junk and will play with it for hours and you can't put a price on silence while driving in the car. I've filled these bags with little race cars, Army soldiers, flash cards as well as candy and other knick knacks. Do not put kazoos in these bags. I repeat, do not add kazoos. (I speak from experience). Once again, no muss no fuss and all of the elements are contained within the toy. While there's pocket-sized versions of these toys available (usually in the $5 toy bins at Target), the full-sized ones work just fine too. That no one could ever win. I'm convinced the rings we're too small for the posts or the floaty circles were too big for the boxes. Regardless these are great fun until your child discovers that they can pull the plug. Once that happens, game over. Literally. Not only do we love these Brain Quest game cards for when we're riding in the car but we've also started using them in restaurants while we travel. They're a great way to pass the time and keep your kids engaged, entertained and laughing! Now that you've got all these great ideas for your next excursion, where are you going to put them? I usually keep a Scout utility tote in the back of my car but also use one of these seat organizers to keep some of the smaller things within an arms reach of the boys. What are some of your must-have toys for kids while traveling?